Product #15572 | SKU LX7 | 0.0 (no ratings yet) Thanks for your rating! The Libec LX7 Tripod With Pan and Tilt Fluid Head and Floor Spreader delivers superior value with an aluminum tripod and a pan and tilt fluid head. It has a maximum height of 166 cm and a minimum height of 56 cm. It can handle a load of up to 8kg, and you can trace every motion, start to finish, with its super torque system. The fluid head is equipped with a sliding plate with a sliding range of +/- 1.6". The entire kit weighs 5.5 kg. The LX7 can operate in a temperature range of -4 to +140°F (-20 to +60°C). 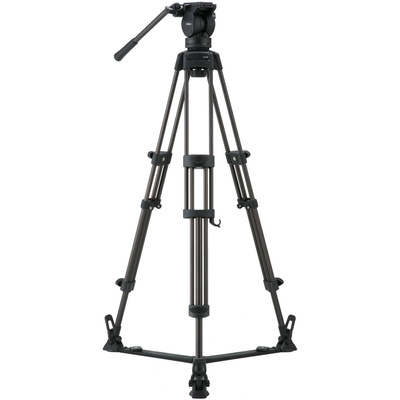 This tripod is ideal for small to mid-sized DV/HD and semi-shoulder cameras.